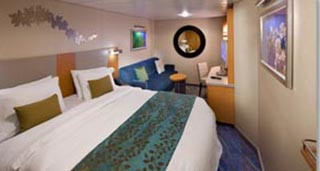 Discover the world of luxury with Royal Caribbean International Cruises. Appropriately named, the Grandeur of the Seas powers through the ocean waves with a magnificent presence, as she transports her 2,000 passengers through the beautiful waters of the Mediterranean and the Caribbean. Guests will feel amazed and inspired as they discover all there is to do on board, with personal and attentive service from the staff making this a truly magical journey. 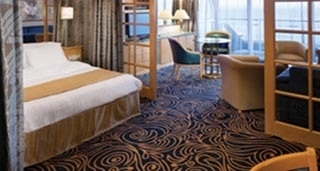 Originally launched in 1995, this Grandfather of ocean cruising went through a $48 million refurbishment in 2012, giving the perfect blend of modern luxuries with classic tradition. Explore the Mediterranean and Caribbean in ultimate style and grace, where an extensive range of activities appropriate for both adults and children will forgive those who miss the insightful excursions in favour of staying aboard the entire trip. With four different stateroom categories, each receiving the luxury of 24-hour room service, guests will find that their needs are easily met. 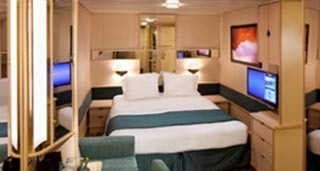 The Inside Staterooms include a keypad-operated security box, a hair dryer, Wi-Fi internet access, a mini-fridge and a flat-screen television with a range of channels. 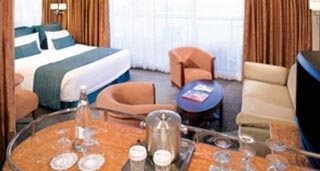 The seating area is a comfortable spot to rest and recharge, as is the fantastically cosy Royal King bed. Guests are also welcome to upgrade to a Family Interior, nearly double the size and ample room for sleeping up to six people. The private bathrooms are complete with a roomy shower and complimentary toiletries. 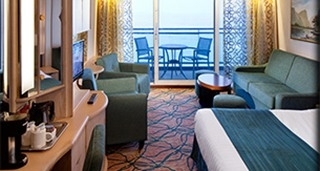 The Ocean View staterooms have the additional feature of a porthole window to look out from, and the family sized Ocean View staterooms upgrade this window to be a panoramic wonder. Indulge yourself in the benefitted Superior Balcony Stateroom, giving passengers the opportunity to step out from the lavish interior to feel the fresh sea air outside. The range of suites vary between the Junior Suite, measuring an impressive 287 square feet, to the exclusive Royal Suite, measuring a phenomenal 1,209 square feet and including a marble whirlpool and a baby grand piano. All suites include a balcony, as well as unlimited use of the Concierge, and access to the Concierge Club serving complimentary pre-dinner canapes and cocktails. The Great Gatsby Dining Room is the perfect venue for an elegant and refined meal, perfectly encompassing all the grace and glamour associated with the novel. The menu consists of gourmet food served to an exceptional standard by fantastic chefs, masters in their field. For a more informal dining option, visit the Windjammer Café for a buffet-style serving both hot and cold delights. While the speciality is regional Asian food, Western favourites are also available so that every guest is catered to. The other speciality restaurants on board also include the traditional steakhouse, Chops Grille, and the gourmet Italian eatery, Giovanni’s Table. With wide ocean views to compliment a five-course meal, guests will end the evening in total tranquillity. For a casual coffee, there is nowhere better than Latté-Tudes. For a catch up with friends or some relaxing alone time, this atmospheric coffee bar provides the perfect setting. For a sweet treat, Royal Caribbean have provided the much-appreciated Ben and Jerry’s ice cream stand, dishing out world famous ice cream daily. Thanks to the sheer size of Royal Caribbean’s ship, a fabulous wealth of activities keep guests entertained. Enjoy a professional quality production in the tastefully decorated 875 seat Palladium Theatre, displaying awe-inspiring performances from renditions of ‘Hairspray’ to gravity defying aerobatics. For a smaller scale, but equally impressive performance, visit the 575 seat South Pacific Lounge for cabaret acts and late night, adult only comedy acts. Increase your strength on the rock-climbing wall, suitable, safe and incredibly entertaining for both children and adults. Sprawling over two decks, the Vitality Spa is a sanctuary for rest and relaxation. Staffed and operated by Steiner Leisure, the trained and professional therapists will perform revitalising massage therapies, facials, and body treatments to coax your body back into a re-energised and replenished state. Work up a sweat in the well-equipped Fitness Centre, complete with cardio and resistance machines, an aerobics exercise room and sauna and steam room for a post workout recovery. Enrich your mind by viewing the Art and Photo Gallery, open to all passengers and filled with breath-taking images. Soak in the sun by either of the two pools or six whirlpools, or if the weather unexpectedly turns, get your fix of rays in the on-board solarium. Alternatively, the video arcade provides a throwback to the retro games, still enjoyed today. Choose between a wealth of bars and lounges in which passengers can enjoy a drink, enjoy a book from the library, or listen to some uplifting music. 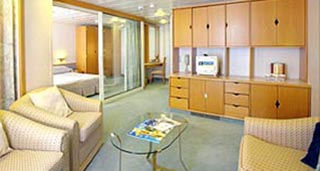 From sophisticated ambiances to fun and flirtatious venues, the Grandeur of the Seas has it all. Single - Guaranteed Note that this is a guaranteed category and no particular stateroom number will be assigned until passengers are on board. Two twin beds (can convert into queen-size), sitting area with sofa, vanity area and a private bathroom. 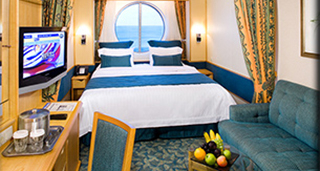 Please note: Staterooms 2008-2014 & 2508-2514 have two portholes instead of a window. 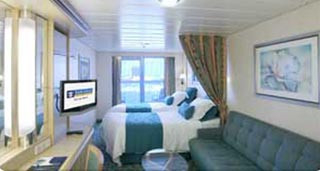 Two twin beds (can convert into queen-size), private balcony, sitting area with sofa bed, and a private bathroom. Note that this is a guaranteed category and no particular stateroom number will be assigned until passengers are on board. One bedroom with lower twin beds, one bathroom with shower, living area with double sofa bed and lower twin beds that convert to queen-size bed. Two twin beds (can convert into queen-size), private balcony, sitting area with sofa bed, refrigerator, private bathroom, bathtub, vanity area, closed-circuit TV and phone. Also referred to as Junior Suite. Note that this is a guaranteed category and no particular stateroom number will be assigned until passengers are on board.